Call it a barometer of the Herman Cain brand: Calls to a slew of Godfather’s franchises across the country suggest Cain’s celebrity has failed to stimulate sales of Sicilian or pepperoni slices. Can Cain move voters if he can’t move pizzas? Herman Cain, the former CEO of Godfather’s Pizza and current GOP primary frontrunner, is running a campaign focused almost entirely on his business savvy. And he’s brought national attention to the Godfather’s brand, which has received nonstop coverage from every major news outlet (CBS, The Washington Post, Politico, to name just a few). But while Cain is successfully selling himself and his “9-9-9” “9-0-9” tax plan, it appears there’s one thing he’s not selling very well on the campaign trail: pizza. If Cain’s popularity can’t even sell significantly more pizzas, can he really claim a mandate? 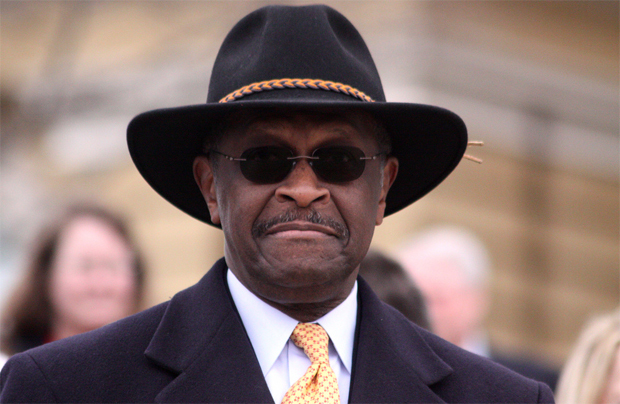 Said one branch manager at a Montana location when asked about Herman Cain, “Honestly, I have no idea who that is.” Nearly all the franchises reached reported having no uptick in sales or foot traffic. At a branch in Waterloo, Iowa, a manager said, “We’ve actually been a little slower for some reason–I don’t know why.” Outlets from Topeka, Kansas, and Chesterton, Indiana, to Omaha, Nebraska, and Houston, Texas, to Forest Grove, Oregon, and Savannah, Georgia, reported no change in business due to Cain’s newfound stature. Godfather’s Pizza declined to participate in this story. The company would only provide a statement, which indicated the company does not disclose any sales figures. “Godfather’s Pizza takes no position on political candidates, but we do make great pizza,” the statement also said. Elections have winners and losers, but it’s unclear on which side of that spectrum Godfather’s (or Cain) will land. For most candidates and their brands, losing is rarely a bad thing. Mike Huckabee used his strong showing in the last presidential primary to score his own show on Fox. Sarah Palin’s buzz sparked huge sales of her books and even a reality TV series. And don’t forget about Donald Trump, whose rumored run for office ate up a month’s worth of news cycles and drove ratings on Celebrity Apprentice. This year’s election is no different, with every candidate from Michele Bachmann to Newt Gingrich trying to bolster their brands on the national stage–and sell everything from autobiographies to fiction novels to documentary films. But while Cain is certainly selling (and buying) copies of his own book, no one will officially say his marketing success and rising poll numbers have had broad-reaching impact on Godfather’s pizza sales, though the company’s brand awareness has undoubtedly risen. It’s an issue that speaks to the true extent of Cain’s brand: Is he a long-term powerhouse candidate or merely a flash in the pan? That question helped inspire recent dueling stories from both The New York Times and Politico, with John McEnroe-esque headlines questioning whether Cain is a serious candidate.